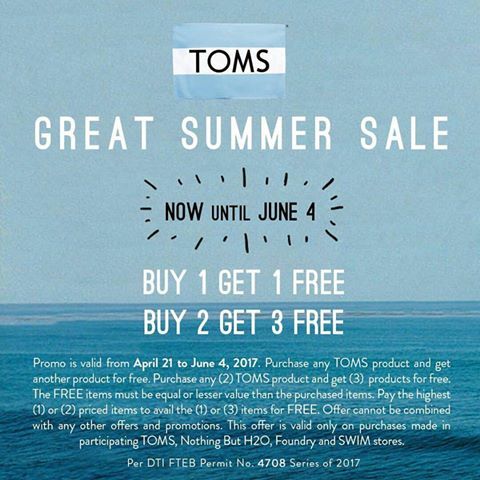 TOMS Great Summer Sale is already in full swing until June 4, 2017! Whether you are looking for shoes for children or adults, TOMS has something for everyone. This includes both classic, wear-forever styles and the latest trends. Get up to 5 TOMS items for the price of 2! Buy 1 product and get 1 for Free. But if you Buy 2, you will get 3 items for Free! Shoes for men, women and kids, sunglasses, and bags are included on this promo. 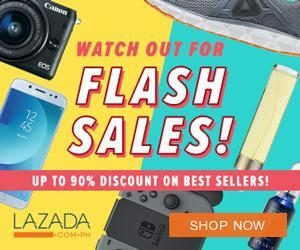 This is an amazing deal that shoe lovers should not miss. Note: FREE items must be equal or lesser value than the purchased items. Feel free to visit any TOMS branches at Megamall, SM MOA, Glorietta 1, SM Aura, Nothing But H2O Trinoma, Nothing But H2O Alabang, Nothing But H2O Boracay, Foudry Westgate Alabang and SWIM Rockwell for this awesome deals. Just a little bit of a background, TOMS donates a pair of shoes for every one it sells. The ethical footwear company has been pledging one pair of shoes for a child in need for every pair of shoes sold. This revolutionary One for One® concept makes them much more than just a company. They are in the business since 2006 and have been of improving lives and making an impact in the world. Credits to TOMS Philippines Facebook Page and TOMS official website.